This is totally not medically related but I can't help putting in my two cents. I saw this while driving home and I had to do a double take. 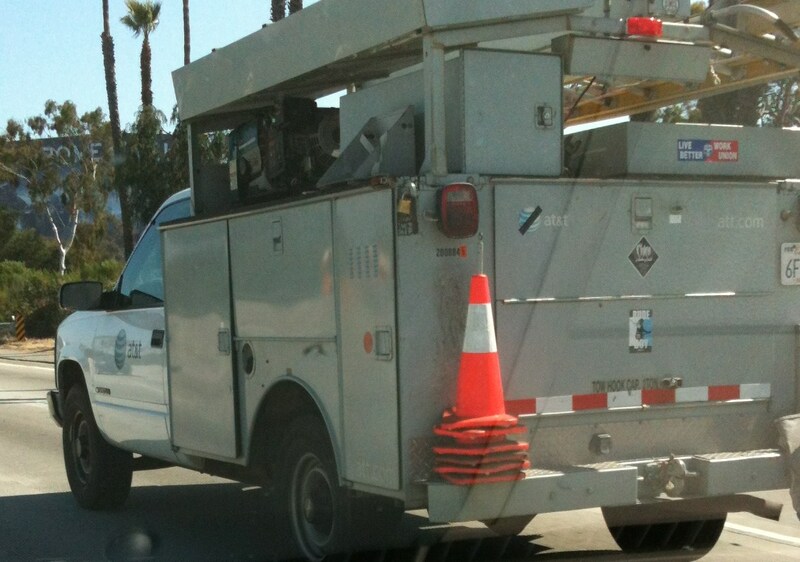 Here is an AT&T utility truck going down the road. You can tell it belongs to the phone company by its corporate insignia on the driver's door. You'll also notice on the back of the truck another AT&T corporate logo, this time with a thick black bar across its iconic blue and white globe. I was flabbergasted when I espied this truck. Here are AT&T employees driving a company owned vehicle. Yet at the same time they have defiled their own company's logo as a political statement against the very company that is paying their paychecks. That is the definition of brazen. They essentially have turned a company car into a rolling billboard for their disgust with management. That would be the same as me walking around the city in hospital owned scrubs with a big slash across my hospital's name printed on my back. Now I know union members can have confrontational relationships with their employers. 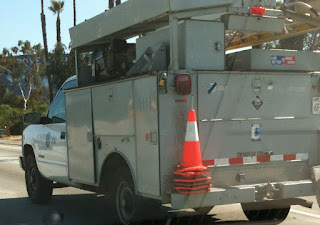 How do I know the truck's occupants are union employees? Witness the blue and red sticker featured prominently on the back that reads "Live Better Work Union". But as far as I know there are currently no labor issues at AT&T. Also usually once a labor agreement has been reached the animosity is set aside, especially in public situations. There's also the question of employee loyalty. Even after the worst UAW strikes against the American auto makers, the employees still purchased the cars of the manufacturer they worked for, be it Ford, GM, or Chrysler. When there are labor relationship issues in hospitals, public show of confrontation usually last only one or two days. Picket signs are confined to hospital sidewalks then promptly put away. Hospital employees don't drive around with inflammatory statements pasted on their cars, especially hospital owned vehicles. Either AT&T management doesn't mind how their employees are disparaging them in public or their employees don't care about how the airing of their dirty laundry can create a public perception of corporate chaos. Could this be the heart of the public perception of bad service at AT&T? But yes, if this is a deliberate statement by the employees, it's counterproductive and should be subject to discipline. I don't blame the ATT employees at all. How many employed docs HATE the hospital or health care system that employs them? How many employed docs publicly are afraid to criticize their employer, but privately vote in med staff elections for the docs who are most hostile to the administation? The only thing that concerns me about your blog post is the clearly unresearched statement: "But as far as I know there are currently no labor issues at AT&T." Really? Your blog post is dated Tuesday, May 22, 2012. No labor issues? I beg to differ. Anonymous, I am guilty as charged. I did absolutely zero research on the current labor situation at AT&T. Would you mind enlightening our readers about the cause of the animosity displayed by the drivers of this truck? ZMD you are clueless with the problems with management and workers at at&t.Our latest problem at&t when directly to manufacturer for supplies instead of a central warehouse and then dispearing material by ups,fedex...ect. Its taking fives times longer getting the material out---workers don't have material to do the work---whoses fault is that. I received this email from one of my readers. As an AT&T employee, he has clarified the meaning of the black bar on the corporate logo. I've removed his name and email address. I am an AT&T Splicing Tech in California. Just wanted to let you know that the Black Line thru the AT&T Logo is a sign of Mourning... Somewhere in the past... The Technicians of old stole this tradition from Police/Law Enforcement. When a Police Dept,Sheriffs Dept..etc... are in mourning over another officers death, they wear a black band horizontally over their badge. I know it looks odd, but from your picture, I can tell u that's exactly what it is. When AT&T techs do this, it was probably another Tech, manager or Retiree who passed. On a parting note... Just wanna tell you that before I came to work for AT&T, I was a U.S. Air Force Pararescueman... And I appreciate the job those of you in the Medical field do for all of us.